The body overseeing Egypt's presidential election disqualified 10 candidates from the race on Saturday, including the Muslim Brotherhood's Khairat al-Shater, former spy chief Omar Suleiman and Salafi sheikh Hazem Salah Abu-Ismail, Ayman Nour, and Mortada Mansour. The candidates have 48 hours to appeal against the decision. The disqualification of some of the leading candidates would redraw the electoral map with just weeks to go before the May vote that decides who will replace Hosni Mubarak as head of the Arab world's most populous country. A council of military generals has been governing Egypt since Mubarak was swept from power a year ago in a popular uprising against his rule. Abu-Ismail's candidacy has been in doubt since the election commission said it had received notification from U.S. authorities that his late mother had an American passport, a status that would disqualify him from the race. Abu-Ismail followers have held several demonstrations to warn against any move to disqualify their candidate. On Friday they besieged the headquarters of the election commission, forcing it to evacuate the premises. His lawyer, Nizar Ghorab, told Reuters he expected "a major crisis to happen in the next few hours." A spokesman for the Shater campaign said their candidate had already prepared his appeal. Shater's candidacy had been in doubt because of a former criminal conviction. "We will not give up our right to enter the presidential race," said Murad Muhammed Ali. "There is an attempt by the old Mubarak regime to hijack the last stage of this transitional period and reproduce the old system of governance." 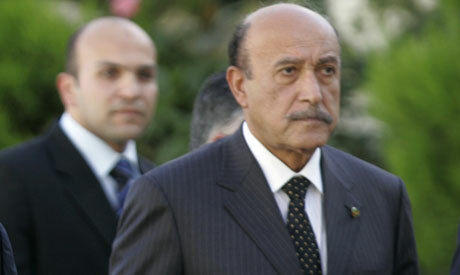 Suleiman, appointed deputy president by Mubarak in his last days in power, entered the presidential race at last moment, triggering both concern and heavy criticism from reformists who see him as a symbol of Mubarak's rule and a danger to democracy. Hussein Kamal, a top Suleiman aide, told Reuters his campaign would also challenge the commission's decision. "Omar Suleiman will take legal route to challenge this decision to exclude him from the presidential race," he told Reuters. It's obvious they only d/q Omar Suleiman to 'appear' fair. I wouldn't be surprised if they let him back in on appeal (maybe he has a 'black box' on the election committee too). This is a still-born revolution. Dead at birth. A revolution with the same government (Shafiq or Moussa), same military, same constitution and no real election! Still. I am not worried. SCAF are going to carry out the revolution properly. Exactly what they have promised. The ship will apply in the end! Save. This happened for other reason other than SCAF wanting it. Abu Ismail was in 2nd place in polls and if he made it to run-offs he would definitely beat Amr Moussa with the entire Islamic vote behind him. Also, Shater, being the MB's candidate would definitely have made it to the top 3. SCAF is playing a very dirty game and why? Just because they want to secure their financial interests and immunity from accountability. This proves all along that SCAF has been trying to counter the revolution from the start. They allowed a free fair parliamentary elections because parliament pretty much have no real power of authority.